James Blaylock’s so-called “Christian trilogy” (a poor nomer at best) is one of fantasy literature’s unheralded, and for most readers unheard of, classix. Laden with subtle wit and charm, they are novels for the more discerning reader looking for something beyond the mainstream. A “Christian trilogy” only in the sense that each of the three novels uses some element of the Bible to spin a tale of the fantastical intruding into contemporary American life (The Last Coin features the coins Judas received for selling Jesus to the Romans and The Paper Grail posits a unique take on the “Holy Grail”—read to find the reason for the quotes), each is, in fact, more humorously irreverent and picaresquely capering than religiously staid. And they are driven by wonderfully kooky, off-kilter characters that keep the stories dynamic and engaging. 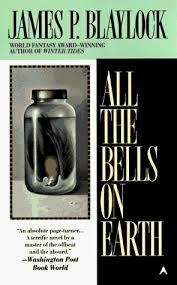 Looking at a classic Robert Johnson deal with devil through the lens of 90s money scams, All the Bells on Earth (1995) is the third novel in the “trilogy”. The small, quiet Californian community of Santa Anna is turned upside down one evening when a madman climbs the tower of the local church, loosens one of the bells, then vandalizes the hell (pun intended—don’t’ judge me) out of the church’s sanctuary. The madman dying in the strangest of ways, his death is impossible not to be noticed by the small community, including Robert Argyle, a shady catalog merchant, and his competition, Walt Perkins, likewise a catalog salesman though one of clearer moral conscience. Investigating the remains of the madman’s house in the aftermath, Perkins turns up some very strange evidence, something which Argyle seems to have known about. Tension between the pair escalating, Santa Anna may never be a quiet community again. As with The Last Coin and The Paper Grail, All the Bells on Earth is a character-driven story that plays in the interstices of American culture and with the fringe characters who populate it. Catalog merchants, pyramid schemes, mobile home tomfoolery, supposed mystical artifacts, midnight pranks, donut shops—all form the threads creating the novel’s story. But where The Last Coin and The Paper Grail were largely cut from the same mold (good guy vs. bad guy for lack of a better description), All the Bells on Earth expands its main character list. Of course one can argue Argyle and Perkins form the lion’s share of the narrative, but side characters and the nature of the story’s premise (not to be spoiled here) demand a broader range of developed characters, which Blaylock delivers. Santa Anna comes to feel like a populated community and the narrative possesses a layer of complexity that, while still technically a good vs. evil production, feels more expansive, though, one might argue, not 100% necessary. The reverend, Rich, Ivy, Eddie, Nora, and the other characters give a holistic feel that does not belie boiling the novel down to a dichotomy of interests.